I visited my mother and her husband yesterday, they were eating and there was still enough leftover and I got a plate too. Of course, when something looks so delicious, I take a photo. I had potatoes, goulash, red cabbage and a tasty sauce on the plate. I’d say this is a very typical German combination. 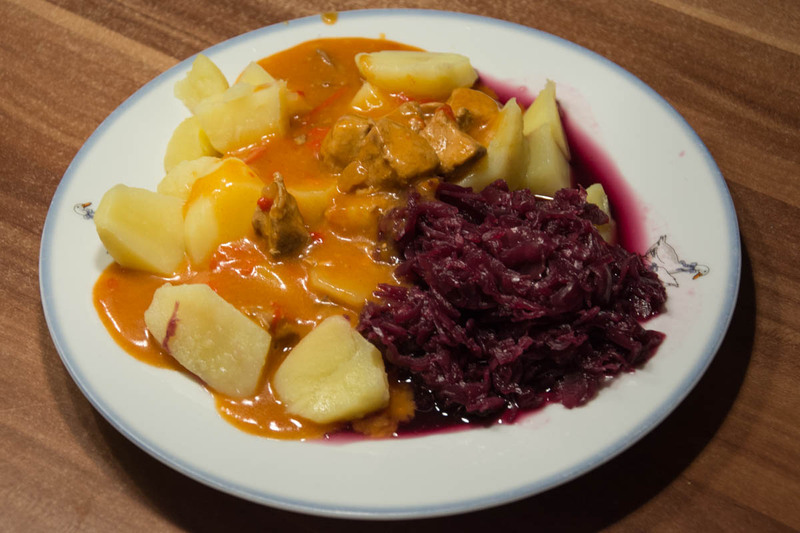 We often eat potatoes, as same as red cabbage and goulash. I am always happy if I can take a photo of tasty looking food, because I am always interested to expand my food category on the blog. I had Sauerbraten today with red cabbage and spatzle. I love the red cabbage and the spatzle is very good mixed with the gravy from the Sauerbraten. Do you have German pubs over there or did someone cook it for you? I love Spätzle and you remind me I should try a Sauerbraten again too. We have been eating there since 2002. It is owned by Uwe and Dagmar. I rarely see Uwe but his food is delicious. Dagmar is so friendly that it feels like we are eating with family. That’s awesome. I like to visit international restaurants too. My favorite is asian style food, like Chinese, Vietnamese or Indian kitchen… except that I skip anything that contains fish or something from the oceans because I don’t eat that. When I go shopping for groceries, there is a small stand in front of my favorite store, and they offer American burgers, I usually like burgers but not theirs. What is even more funny, the English on the card is horrible, it seems that the owner doesn’t speak English that well (laugh). I usually don’t complain about something like this, but if you are calling your service “American burgers”, you should at least get the English right on the card. It’s a German person, he probably just jumped on the burger bandwagon. I know America is not only about burgers, but in my city there is sadly no restaurant that offers any American dishes. I know from documentaries that you have some awesome things there. I remember a documentary, I believe it was about New Orleans and blues music (I love blues), and they mentioned that they cook some really spicy stuff in the South or in Louisiana. I like to eat spicy and would like to try it out. Is this just a thing in New Orleans or also in Florida? I bet it’s the same overthere, even if everyone is doing it, I believe you can’t speak of a German kitchen because it completely varies depending on the federal state. Sauerbraten is a great example, it’s very uncommon here in the North, you barely find someone who is preparing it, it’s probably more Bavarian style, same for Weißwurst as an example. I guess it’s the same in America and you can’t speak of a American kitchen since you probably have tons of local specialities too. Am I right? I think that’s what I learned in the New Orleans documentary, they mentioned they have local specialities in Louisiana that are really really spicy but not common in every American state. Or was the documentary about Mississipi? I just know it was about a state and city in the south. You are right. There are a lot of different foods depending on where you are in America. Food is spicy in the south near New Orleans, probably because many years ago, food spoiled easy in the heat so they used spices to preserve it and hide the taste. New york is famous for thin crust pizza but in Chicago it is a thick, deep-dish pizza. Chicago also has great hot dogs. New England specializes in sea food, especially lobster and Texas is famous for steaks. Here in Florida, most people seem to be immigrants from other states or from Canada, Cuba, Puerto Rico or elsewhere so we have a big variety here. Our German restaurant here has mostly Germans working there. We went to one while on vacation that had only Americans that I could see and the food was not so good. I have heard that Chinese restaurants, even the ones run by real Chinese people, serve much more meat here in America than they would eat in China. I could imagine that they do this. I think it’s probably a trade-off… delivering the experience of that culture, and getting enough customers. I am sure there are some dishes that wouldn’t work here. They probably have to adapt a bit, but still it’s very different. I don’t mind if it’s a bit adapted and still very different or close to what you would get over there. There is a much worse trend here. Italian food is a great example, back then we had a lot of good italian restaurants, today most of them have German owners or cooks. They get their stuff as instant products, they don’t really cook on their own and it tastes like freezed stuff from the fridge, stuff you could get in a groceries store as well for much less money. That’s a sad trend here, everyone can open such a restaurant today, and everyone is really doing it. I noticed the best experience I can get is if I found a restaurant with an “open kitchen” where you can see the cook. These are the ones that are proud to show you what they are doing, it’s not just using a freezed international product. Or just listening to friends suggestions if they spotted a restaurant where they really cook, that works out very well too.